Lower Captain Ahab is located in the Amasa Back Area near Moab, Utah. The trail as we are describing it here is the bottom half of the Captain Ahab trail which begins at the upper end of the HyMasa trail and parallels it back towards the Amasa Back trailhead. We broke our description of the Captain Ahab trail into the upper and lower sections to make the slideshow at the end shorter and because many people only ride one half or the other. A short connector trail near its midpoint divides the Captain Ahab into two sections with Lower Captain Ahab being the more technical half. This post begins at the Midpoint connector of the Captain Ahab trail where the upper and lower sections meet. From the midpoint the trail heads off around Whale Rock. This part of the trail isn't too bad with a few short slickrock mounds to climb over and an occasional shelf to negotiate. 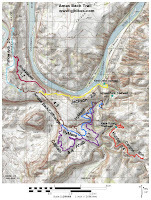 The profile map shows how the nearly 600 feet of elevation change is laid out with only minor uphill sections to deal with during the long descent. As the trail approaches an overlook of Hunter Canyon it crosses some broken slickrock where it comes close enough to the exposed cliffs to make you slow down and pay attention. This is the perfect vantage point for dramatic views of Hunter Canyon and the Kane Creek area. If you have ever hiked Hunter Canyon you probably never imagined that someone could be way up here looking down. After the relatively close encounter with the cliff edge the trail heads back inland along an easy stretch that takes it around to the east side of Whale Rock. After the easy stretch of slickrock and red dirt the trail begins encountering a few briefly technical spots. 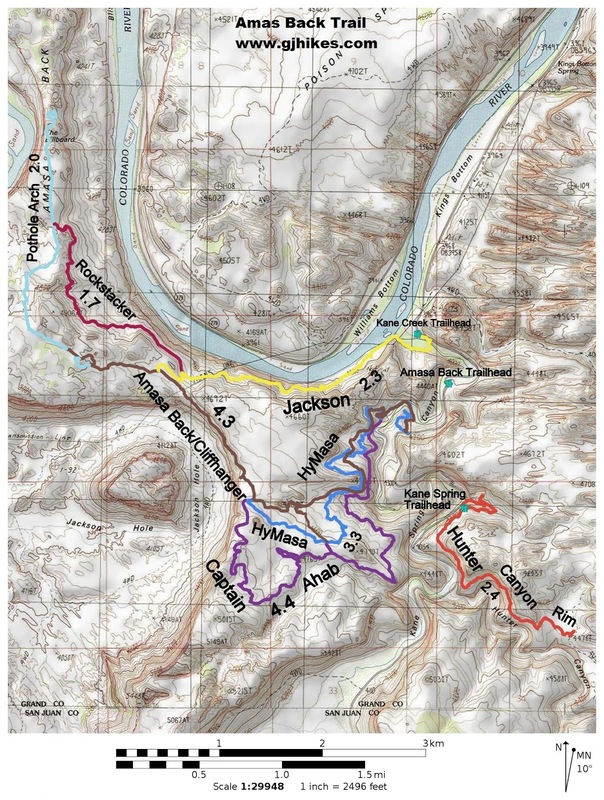 As the trail gets closer to the canyon of Kane Creek it becomes increasingly more technical. We tried to include all of the good stuff in the slideshow at the end of this post but for the most part there are a lot of shelves and uneven slickrock to negotiate. The trail ends up getting much closer to the edge and at one point there is a caution sign and a blue arrow that marks a turn that you will really want to make it around. Captain Ahab eventually reaches the HyMasa and Amasa Back trails and comes to an end. From here it is about a half mile back to the Kane Creek Road. Measuring from the Kane Creek Road the HyMasa/Captain Ahab loop is about 7.6 miles. If you jump on the Captain Ahab trail at the Midpoint and just ride the Lower Captain Ahab loop then it comes out to about 5.2 miles. And if you are parked all the way down at the Amasa Back trailhead and not at one of the pull offs along the road then you will need to add that distance in also. If you would like to see it for yourself then all you have to do is grab your bike or 'Take a hike'.